Moody's estimated the storms caused damage costing $150 billion to $200 billion. Hurricanes Harvey and Irma caused between $150 billion and $200 billion in damage to Texas and Florida, comparable to the costs from Hurricane Katrina in New Orleans in 2005, a according to a preliminary estimate from Moody's Analytics on Monday. Hurricane Harvey battered Houston with record amounts of rain and flooding last month while Irma slammed Florida and other southeastern coastal states. But Mark Zandi, chief economist at Moody's Analytics, said rebuilding from the back-to-back storms will boost the U.S. economy in the fourth quarter of this year and into 2018. "While at this point it’s hard to know how much [damage there is], the storms seem likely to have caused $150 billion to $200 billion in total damage to homes and furnishings, vehicles, commercial real estate, and public infrastructure. This is comparable to the property loss resulting from Hurricane Katrina," Zandi's analysis states. The Moody's economist added that a critical factor in determining the effect on the economy is "how much insurance money and government aid flows to the impacted regions, and how quickly these funds get there ... As with most natural disasters in recent years, we anticipate that the combination of insurance money and government aid with roughly cover the full cost of the property damage and the lost economic output." He also said that the timing and magnitude of the rebuilding bump to economic growth will depend on labor availability in Texas and Florida. "There were already mounting labor shortages in both Texas and Florida before the storms, and they will surely be much more acute in their wake. Enticing construction workers in other parts of the country to the storm-ravaged areas won’t be easy, even at higher wages. Nonetheless, we anticipate most of the rebuilding, save to damaged public infrastructure, to be completed by the end of 2018." 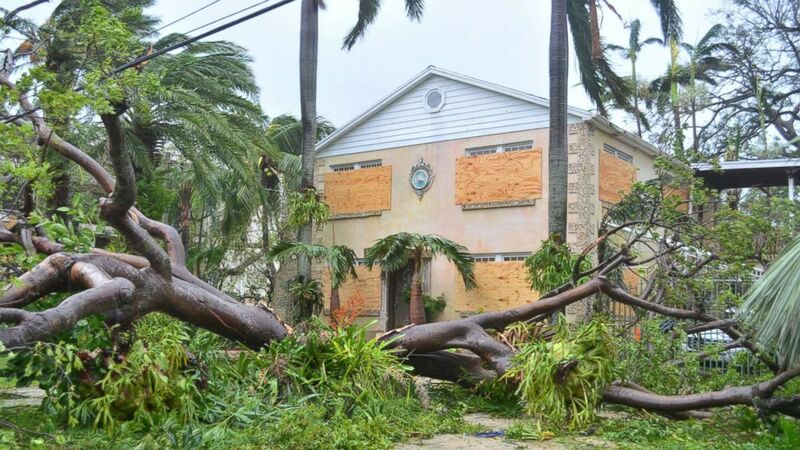 AccuWeather President Joel Myers said in a statement Sunday that his firm estimates Irma's damages to cost about $100 billion and Harvey's $190 billion for a total of $290 billion. Myers said the economic costs include disruptions to businesses, increased rates of unemployment, damage to infrastructure, crop losses, property damage and higher fuel prices. (Alvaro Blanco/EPA) A tree lies on the ground after Hurricane Irma passed through Miami, Sept. 10, 2017. "Some of the losses will be covered by insurance, some will not, so the losses will be felt in a variety of ways by millions of people," Myers said. "Many millions of people have already been evacuated, so their lives have already been affected, and they have incurred costs of one sort or another."